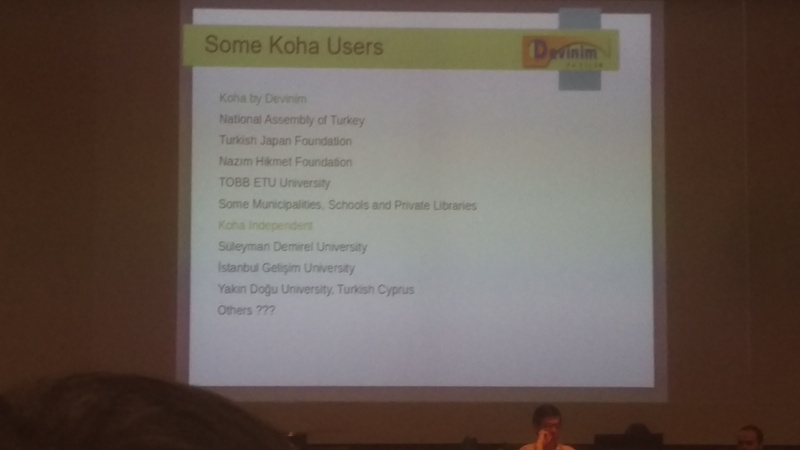 Author ranginuiPosted on June 2, 2016 March 17, 2017 Categories KohaTags kohacon16Leave a comment on Kohacon16 Day 3 – 10 years of Koha in Greece: from solitude to solidarity? Ron Burns from EBSCO was up next to talk about what EBSCO is doing with their Open Source library platform. Then he talked about the current proprietary Library Service Platforms, and likened them to an old set of anitque drawers. And also touched on how they are monoliths and with the bundling of discovery .. leads to lock in. When you factor in the consolidation, there is a real lack of choice for libraries. The new FOSS LSP should be modular and modern. Ron reminded us that open source drives innovation, so of course they should build with open source. They decided to choose the Apache 2 License and copyright transfer to the Open Library Foundation. The community at this point is Kuali OLE, some libraries, Index Data, industry partners, EBSCO. He did a really good job of a high level view of what it might look like. If you look up the presentation online you will get a much better idea than I can impart. Where does Koha fit? The Koha community can decide that. Paul Poulain was up next to talk about Koha and Coral and why/how we should link them. To handle electronic subscriptions in Koha we have 2 options, we can either add a module to Koha. Or we can find an existing FOSS project and integrate it. Coral is an existing FOSS one, so integrating is a good choice. Because Koha and Coral are both web resources there are a few ways we can link them together. They are aiming for middle of 2017 for it to be ready. They have been live on Koha for 2 years it is run as a project from the Ministry of Culture and Heritage. In 2012 MCH signed with Near East University in Cyprus to migrate to Koha 2.2.x. With 900,000 users and 9,000,000 items for the migration. Lots of problems with dirty data, centralising a decentralised model meant lots of duplicates. They also had problems with infrastructure and lack of training. But they worked through this and had a system that worked well. They made quite a few customisations and scripts to deduplicate biblios, the Ministry of Culture and Heritage estimates they saved 5,000,000 Euros on not having to have people do the deduplication alone. In December 2015 they upgraded to Koha 3.20.x. You can return your item anywhere in Turkey, so they make heavy use of the Koha transfers module, which tracks where any item is. This was a fascinating and amazing presentation. Started in Levin, Foxton, Shannon and Tokomaru, now … 1132 cities and towns in Turkey .. mind blowing. Sonia Bouis stepped in to fill a vacant presentation slot with a demo of the Koha sandboxes and showing how to sign off bugs. Once you have found a bug in bugzilla, you can now go to the sandboxes to test, some sandboxes are MARC21 and some are UNIMARC, be careful to choose the appropriate one for you. Author ranginuiPosted on June 1, 2016 March 17, 2017 Categories KohaTags kohacon16Leave a comment on Kohacon16 Day 3 – BIBFRAME: MARC replacement and much more!